Please note: We only list major events such as fund-raisers, hoedowns and conventions here. Many of our member clubs also have one or more weekly events which include lessons and open dancing--too numerous to list here. To see them all please visit each club's website. Co-Hosted by Hoedown In The Dunes Inc. The BIGGEST Little LGBT+ Hoedown in the Midwest! 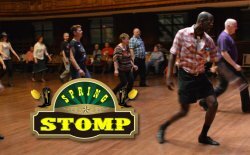 e-mail: Hoedown In The Dunes Inc.
3-Day LGBTQ Dance Event featuring Workshops in West Coast Swing and Line Dancing, plus two ballrooms for social dancing each night with special performances each night. See website link (below) for full information. look us up on Facebook at "BYTOWN BOOTS"